Can't believe we're practically in June already - I'm definitely ready for summer. Summer food you tend to think of smoothies (hence recipe two) fruit, salads & lighter meals, so this recipe may seem a bit random, but I say you can't beat a good chocolate cake - at any time of the year - and this one has the added bonus of being gluten and dairy free so if you have allergies you don't have to miss out. I used regular soft brown sugar here - you can use coconut sugar or another sugar replacement if you prefer. I've find my body reacts exactly the same to any so called healthier sugars as it does to regular sugar, So, I don't eat sweet stuff that often, but when I do I go for the real thing. 1. Line or grease a cm cake tin. so 65 mins is what it takes in my oven, and is a general guide. 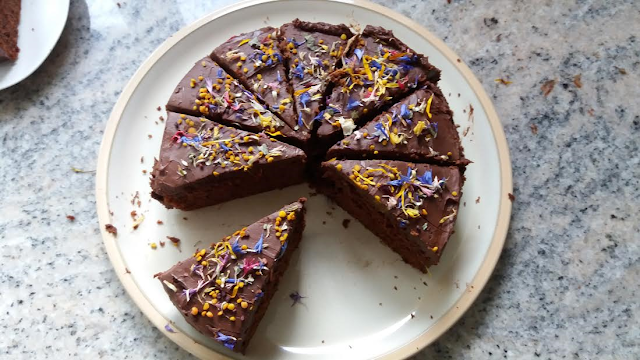 to know if its ready you want it to be firm but springy on the top and if you poke a skewer or a knife in the centre it should come out clean (ie no uncooked cake mix on it). 4 when ready, remove from tin and leave to cool (preferable on a wire baking rack - I don't have one so I use a plate). 5 when the cake is cool it's ready to ice. 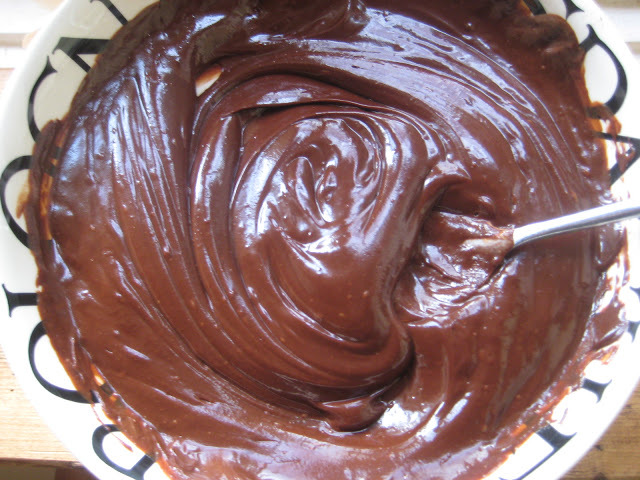 6 break the dark chocolate into pieces and place in a heat proof bowl. Bring a saucepan of water to the boil and then reduce the heat. place the bowl of chocolate over the top and leave until its all melted. 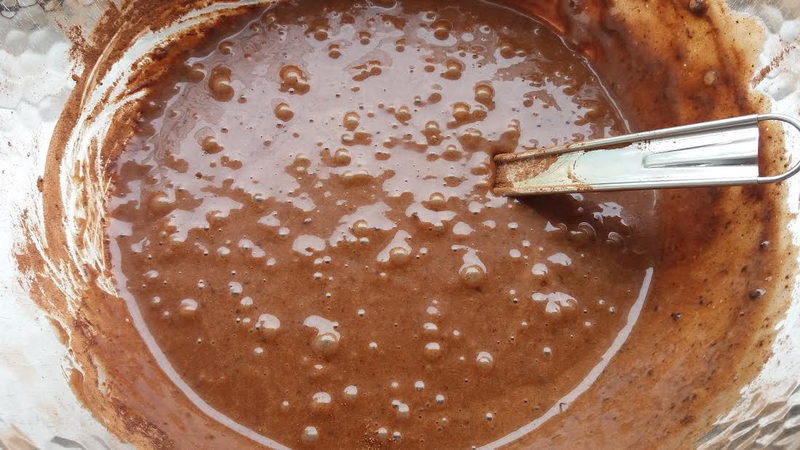 remove from the heat and mix the soy cream (or oat cream or coconut cream) into the chocolate until its all mixed together. place in the fridge for about half an hour to cool and begin to set. 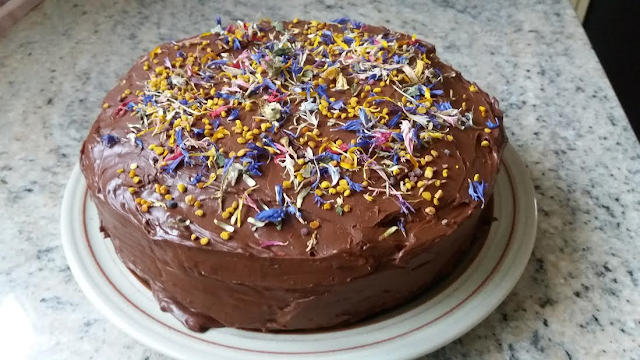 7 when the icing has cooled and thickened but is still spreadable (again, the time this takes will depend on how cold your fridge is, so keep checking) spread it over the cake, decorate with anything you feel like ( I used bee pollen and edible dried flowers). 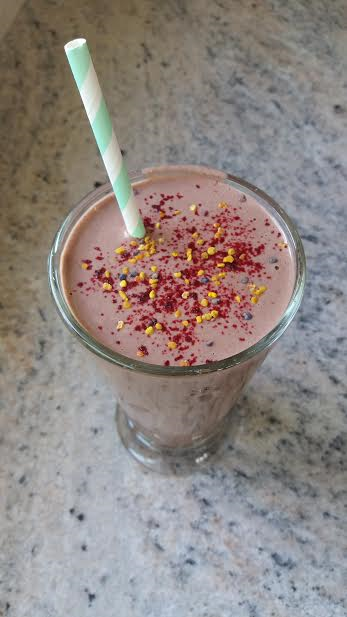 Ok, so in the spirit of balance and moderation, here is my favourite smoothie recipe at the moment! Enjoy! 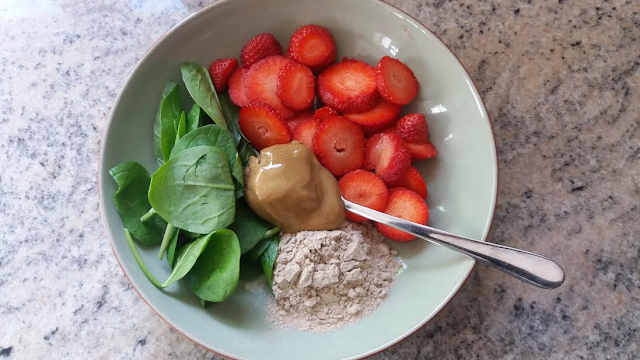 1 place all the ingredients into your blender and blitz. 2 decorated with bee pollen and Beetroot powder if you're interested. Happy June everyone, see you next month. Ginger & tamari Tofu & chocolate banana boat. March! Spring is on the way! the flowers are beginning to push through and its still light at 5 30. 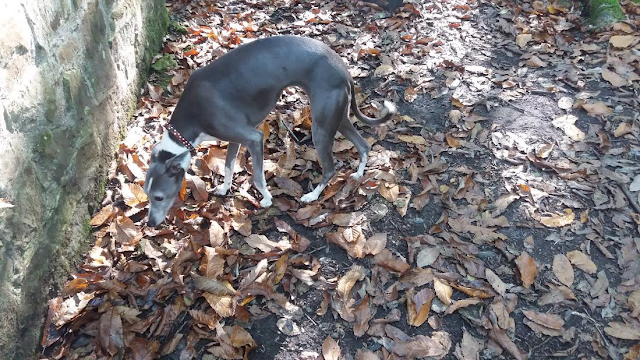 I love spring, and as the days get sunnier and longer our lives get busier as we want to be out & about, making the most of the extra daylight hours, not spending hours slaving away over dinner. So this is super quick, very simple but really delicious. More & more people are eating meatless meals, whether they are turning vegetarian, vegan, or just including more plant based dishes. Tofu can be really bland and uninspiring if you're not sure what to do with it, but this Tofu dish is packed with flavour & will hopefully convert you if you've previously found it tasteless. 4 dessert spoons light oil . I used rapeseed, you can use any other mild flavoured oil. that's it. Just 4 ingredients! 1. 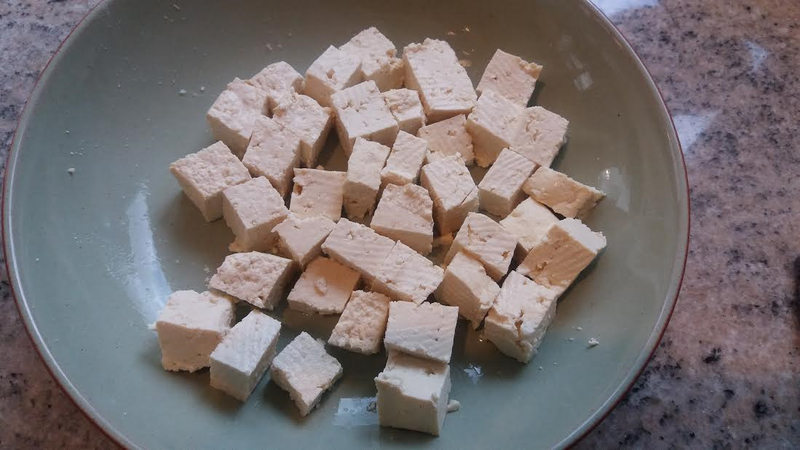 Chop the tofu up into cubes as shown. 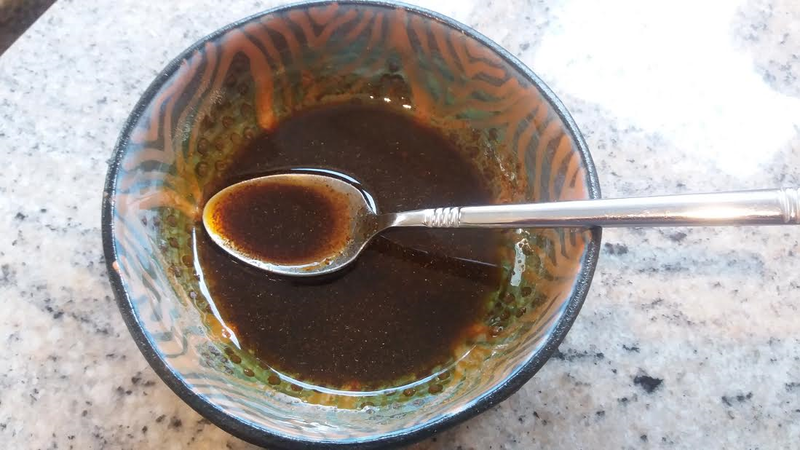 2 In a bowl, mix up the oil, tamari & the ginger powder to make the marinade. 3 Pour the marinade over the tofu and mix well to make sure it is all covered in the sauce. 4 place in the fridge for half an hour. (or fine to be left for longer - half an hour is the minimum). 5. 15 minutes in turn the tofu over to make sure each side is evenly coated. Second option is to place it in an oven proof dish and pop in the oven for 30 mins (180c). 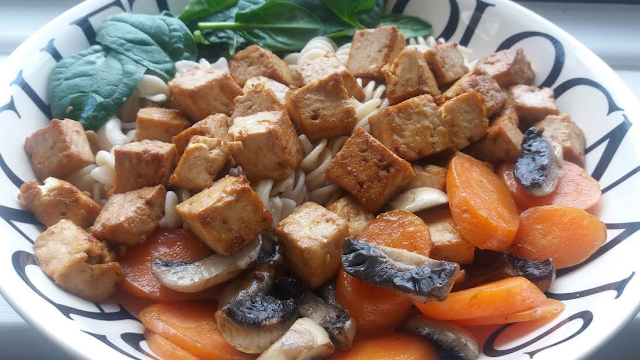 Served here with brown rice pasta, carrots, mushrooms and spinach. 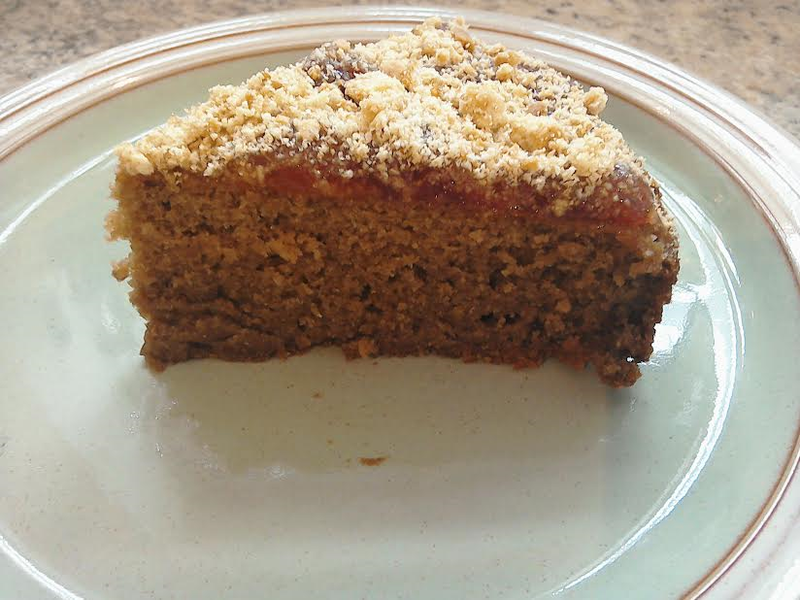 You can serve with rice, quinoa, any veggies you like. Another extra finishing touch (which I forgot - sorry!) 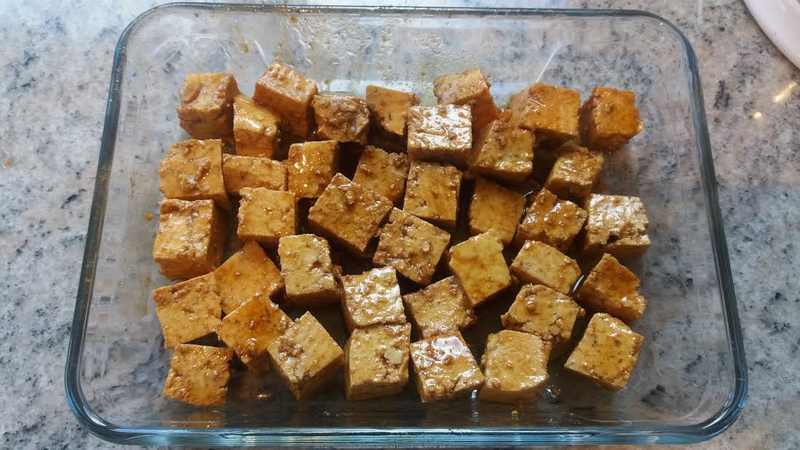 is to sprinkle some toasted sesame seeds over the tofu once its cooked. Whilst your eating your tofu, take 2 bananas, slice them down the middle about 1/2 way through the banana- you're not cutting them in half! and place some chocolate squares in the gap you made as shown. 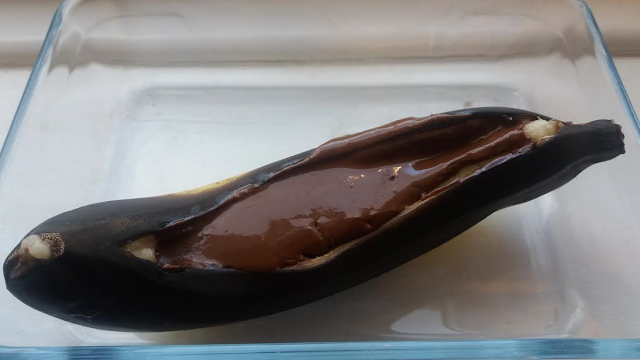 Bake in the oven (180c again) for 15 mins or until the banana skin has turned black and you can see the chocolate is melted. 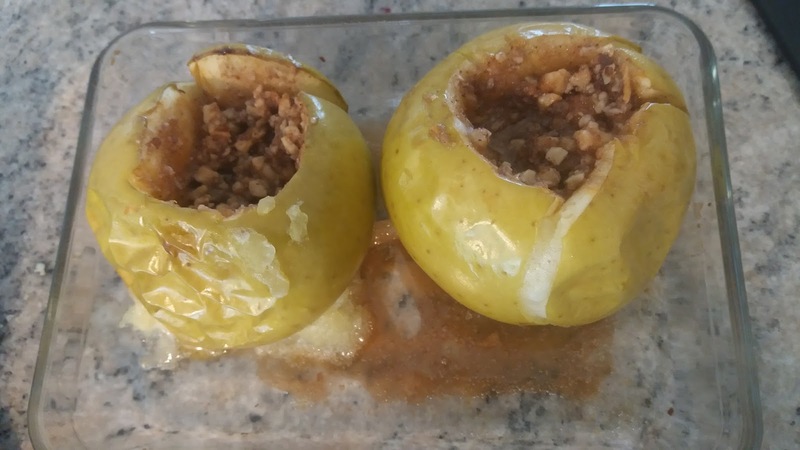 Sooo easy & very delicious! Not the prettiest I know. That's it for this month. Happy spring everyone! Wait, What? No I haven't lost my mind. Don't go! Beetroot works really well with chocolate, gives the choc pots a really nice colour and means that dessert is packed with anti oxidents as well as being delicious. These couldn't be easier to make, and you can make them a day in advance, leaving you more time to spend with your loved one (if you're planning a romantic dinner for two) or just eat whenever you feel like it, if it's just for you. I know some people find valentines day pretty depressing if they're on their own, or in a relationship that isn't working that well. But this time of year when reminders of love are everywhere doesn't have to be about being in a relationship. Celebrate all the things you love most in your life. Your passions, your talents, your friends, family, pets, hopes, dreams. Anything! All the things in your life that make you happy. The more you focus on the good things, you more you will attract other good things into your life. This is honestly so true! two of my great loves! So if you're on your own - great, there's more for you! 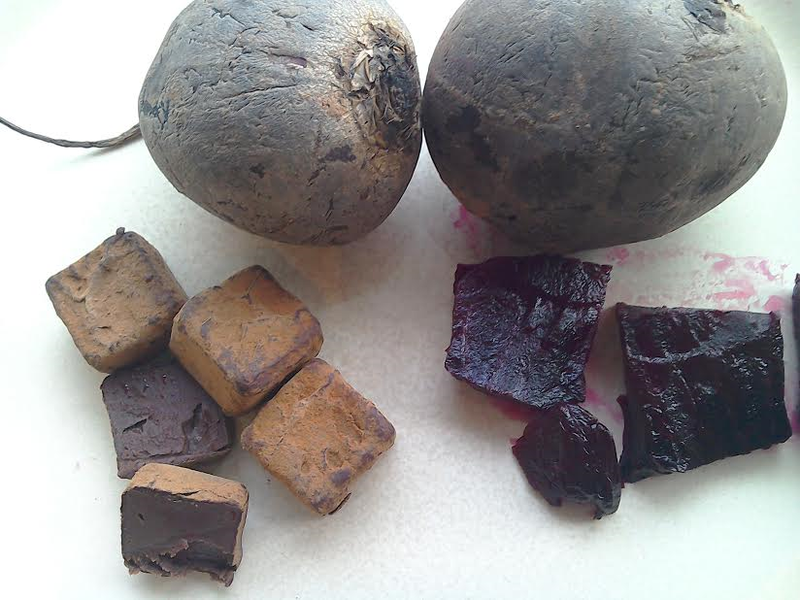 1 for the beetroot you can either use precooked beetroot (NOT the kind that is packed in vinegar!!) or bake it yourself. I make it myself as I much prefer the taste, I take a sharp knife and poke it into the uncooked beets a few times (as you might do with a baked potato). Place into the oven at 180c for a couple of hours, or until the skin is starting to wrinkle and the beet feels soft & cooked when you poke a knife in. 2 break the chocolate up into small squares. Place in a heat proof bowl with the cream. (note it's 100g of cream, not 100ml). 3 Bring a saucepan of water to the boil, then reduce to a simmer. 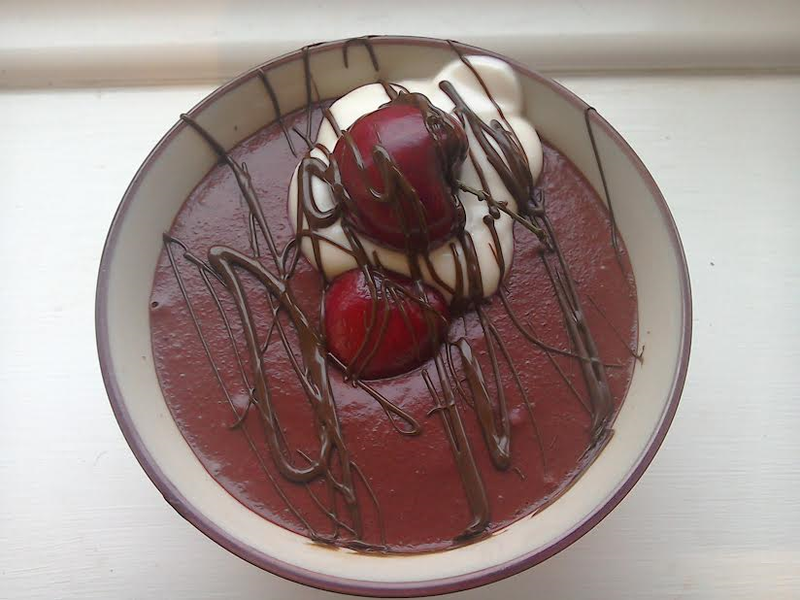 place the bowl on top of the saucepan and let the chocolate melt. stir it as it's melting to mix it together with the cream. 4. 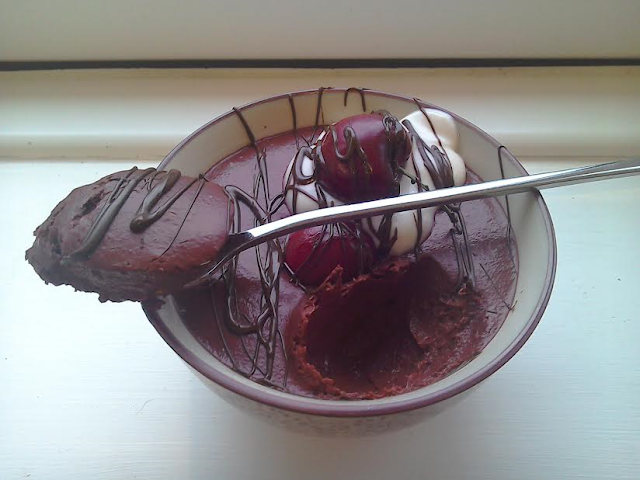 When the chocolate is melted, transfer the chocolate/cream mix to a blender with the beetroot. 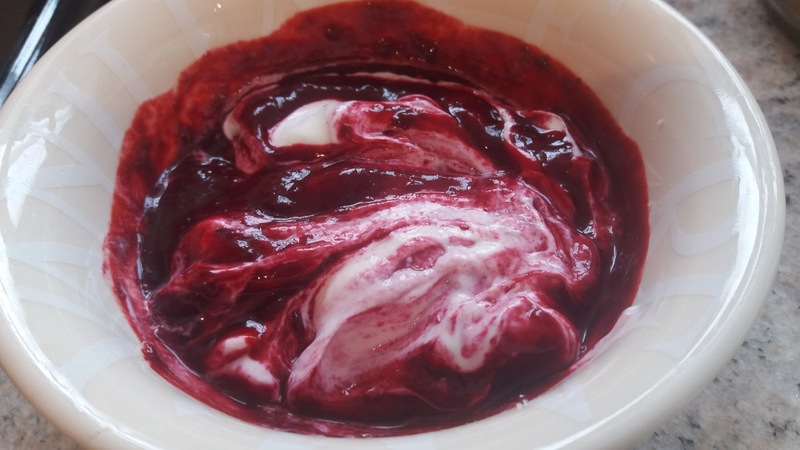 6, Depending on how powerful your blender is, you may want to sieve the mixture to make sure there are no little lumps of beetroot. 7 Divide the mixture into two teacups, wine glasses, ramekins..... whatever you want to serve them in. 8 Leave in the fridge to set - preferably overnight. 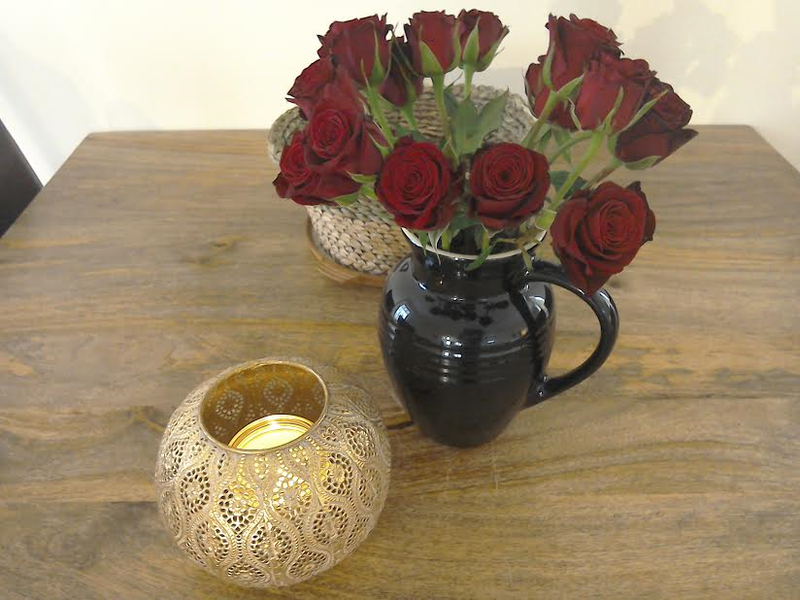 9 to serve, decorate each chocolate pot with a couple of cherries, strawberries or raspberries. 9 take 50g white chocolate ( I used vegan white chocolate, you can use any you like). and melt in the same way as you melted the dark chocolate (without the cream). When it's melted, using a spoon, drizzle the white chocolate over the top of the choc pots. 10. return to the fridge for half an hour or so to set. Or leave in the fridge until you're ready to eat them. Yummm! So here we are at the last post of the year. 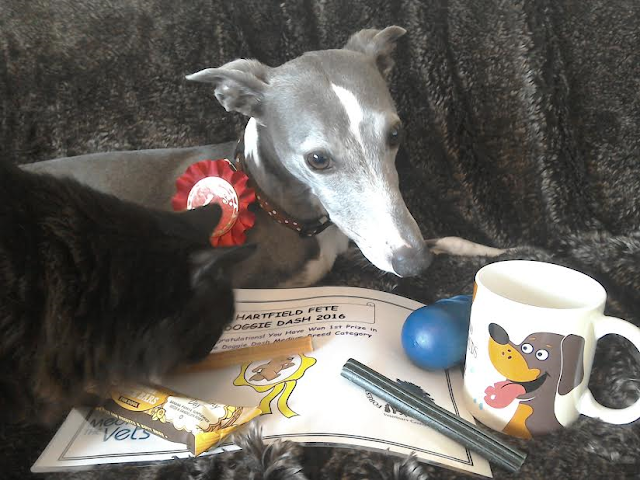 Christmas is almost upon us & everyone is coming to me this year. 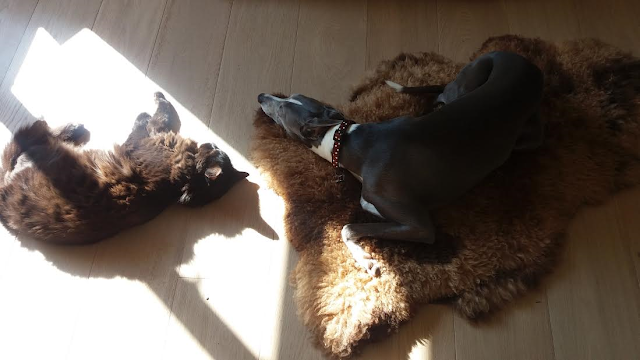 I found out when my younger sister asked me if it was Ok if one more joined us for lunch (her holiday plans fell through). I was like " Of course! Wait. Why is she asking me?....." 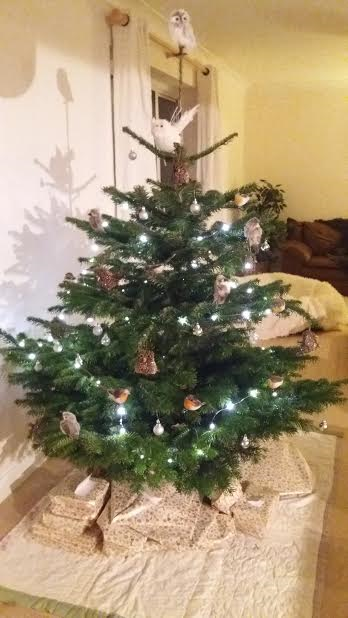 But I'm looking forward to having them all over and have actually got my first ever Christmas tree for the occasion. Love, love, love it! 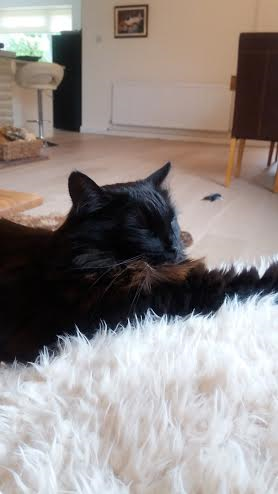 Just hope that a certain black cat can be trusted not to attack it on a daily basis..........although might've helped if I hadn't decorated it with owls, robins & fluffy birds (I don't know what they are). Not everyone likes Christmas cake or Christmas pudding (my brother is the one in our family who will eat it and he's in Spain this year) So this is a yummy, Christmassy alternative. It's not as difficult as you may think, but always looks quite impressive. The great thing about making a yule log is that it doesn't matter if it cracks or falls apart - in fact all the better if it does - it will look even more like a gnarly piece of log! just have fun with it and don't worry about getting it perfect. It will taste delicious no matter what. I've made it with two alternative fillings. The one at the top is covered and filled with buttercream , the one below is dairy free, filled with coconut cream and covered with dairy free icing. 4 bake in the oven for 15 minutes. I know I've said it a million times, but all ovens vary, so keep an eye on it - your oven may take 10 minutes. you want it firm, but springy to the touch. 5 lay another sheet of baking paper on a clean work surface. 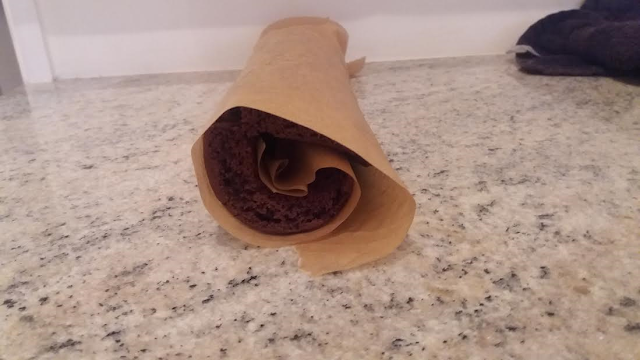 when the cake is cooked, flip onto the paper and peel off the lining paper it cooked on. 2 when the sponge is cool, unwrap it. Spread some of the icing over the flat surface and roll it up again (not in the paper this time). 3 cut a thick, diagonal piece off the log and place it at the side of the log (to make a branch, see main picture). 4 cover the log with the rest of the buttercream. Use a fork to make a "bark" pattern. dust with icing sugar for a snow effect and decorate with Holly. 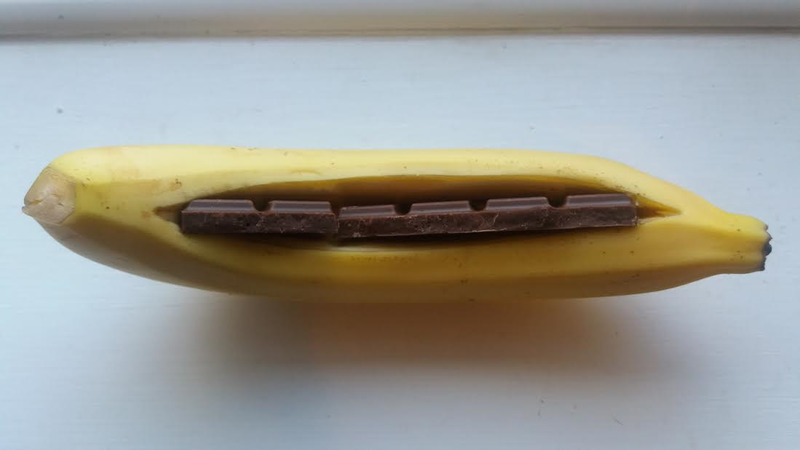 To make the dairy free version. Spread the coconut cream over the flat surface instead of the icing and roll the log up (not with the paper this time). Beat the dairy free spread, the icing sugar and the cocoa together to make the icing. Don't use any water for this one - the consistency of the icing won't be thick enough. 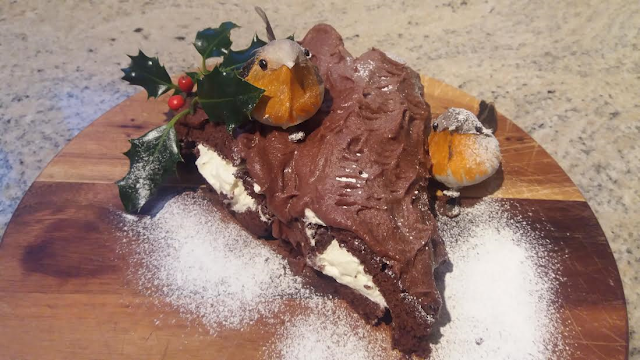 Spread the icing over the top of the log, use a fork to make a bark pattern, and dust with icing sugar for a snow effect. Happy Christmas and a wonderful 2017 to each and every one of you! 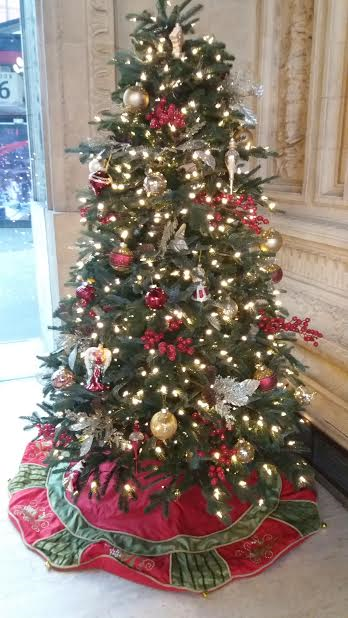 Just to clarify, This is a Christmas tree at the Royal Albert Hall in London, not mine! November! - Not going to lie, it's not my favourite month of the year........ It's usually starting to get cold, wet and Christmas seems ages away. 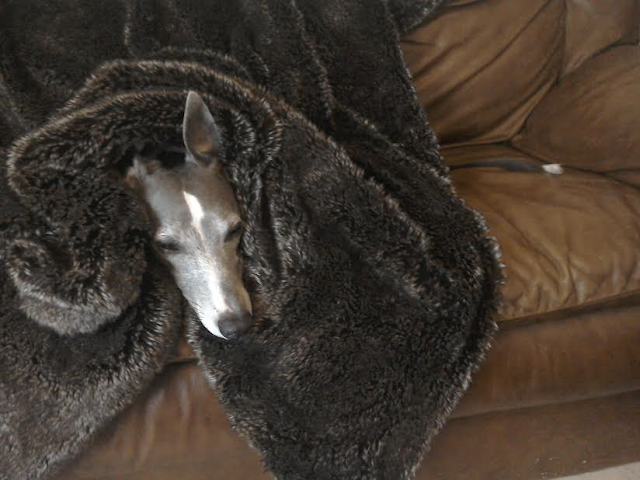 Kia wants to hibernate and I do too! 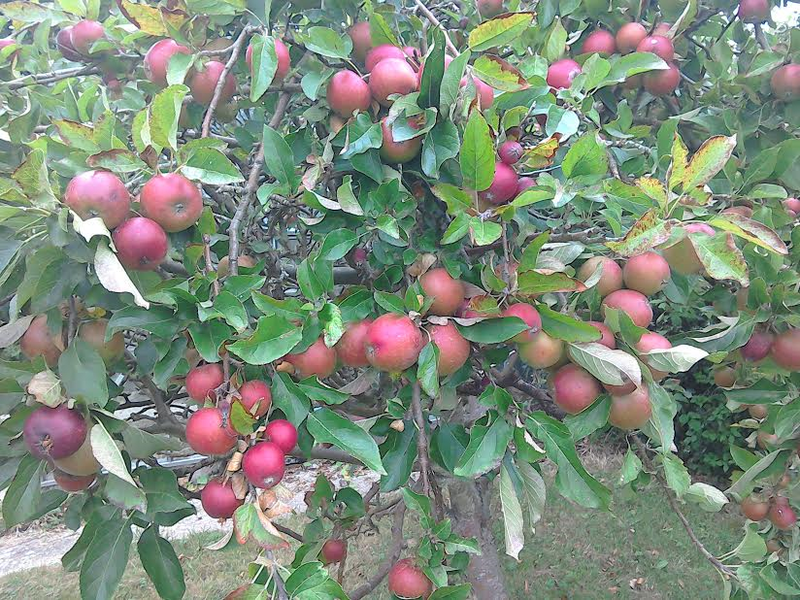 That being said there are some absolutely beautiful autumn colours around at the moment, so it's not all bad! 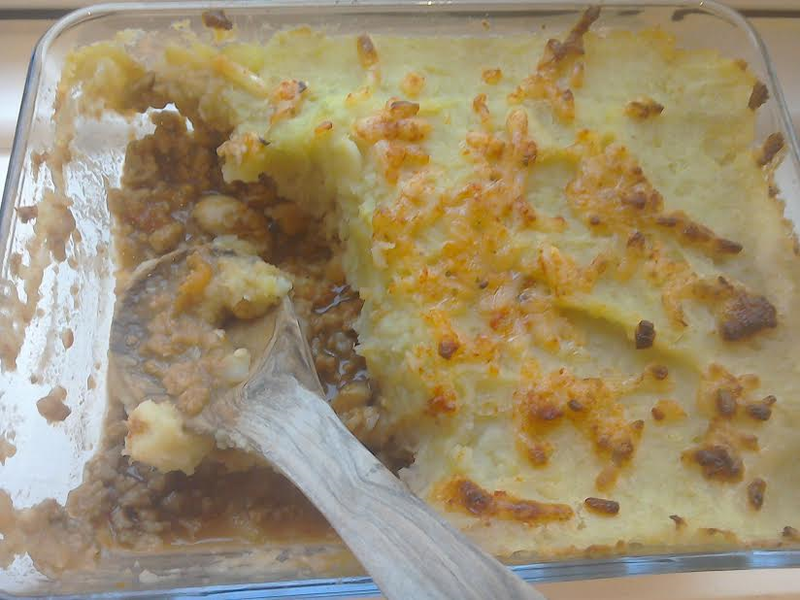 I do however, love late autumn/winter food - Curries, casseroles and best of all shepherd's pie. 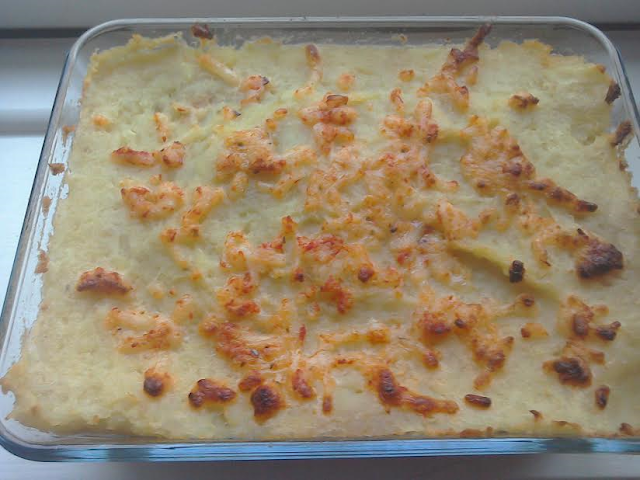 There is already a recipe on the blog for lentil shepherds pie (and its one of the most popular), but this one really is quite different. The other one uses lentils, mushrooms & sweet potatoes, whereas here we're using vegetarian mince, tomatoes and white potatoes...... (oh, er and still mushrooms). 2 Heat 2 tablespoons rapeseed oil in frying pan, over a medium heat. 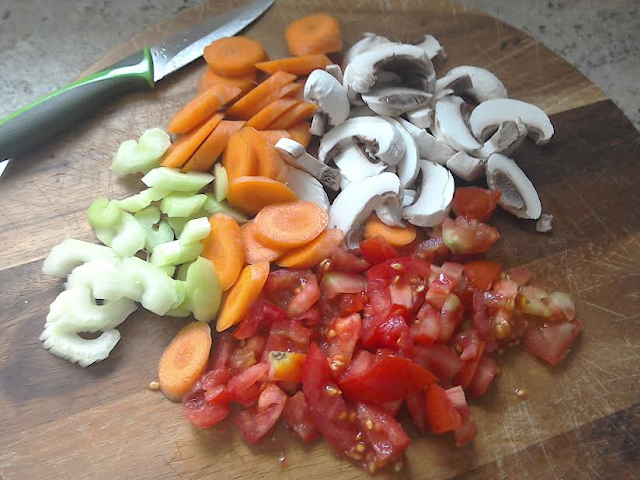 Add the celery, carrots & mushrooms. Stir fry for about 10 minutes, until softened and starting to brown. 3 Add the tomatoes, veggie mince and red wine. 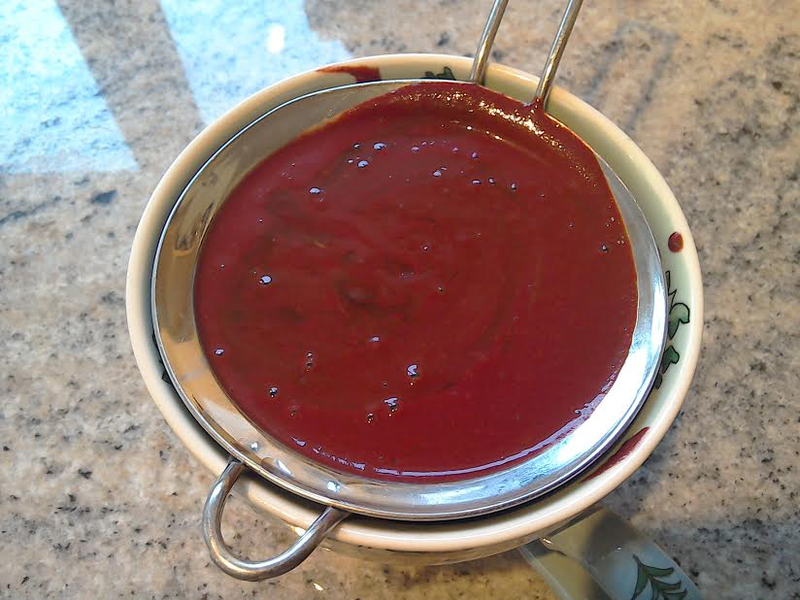 Stir well, then add the tomato paste and the Worcester sauce (you can use tamari soy sauce instead if you like). 4 cook over a medium heat for about 15 mins. ( you want it gently bubbling away). 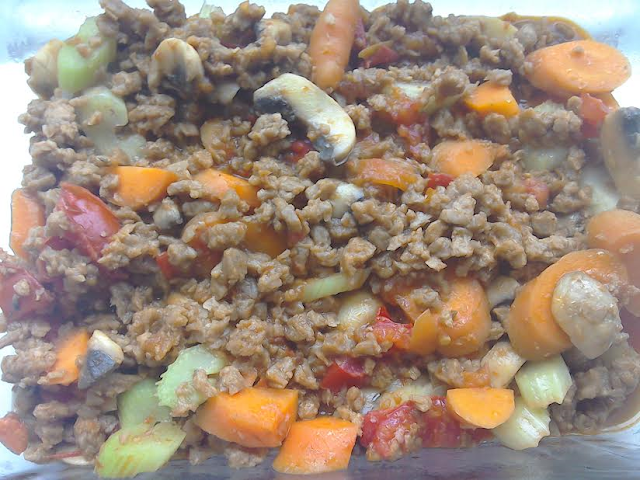 6 When your mince and veggies have had their 10 mins, transfer the mixture to a baking dish. 8. Drain the potatoes, mash with the butter (or butter alternative) and milk. spoon the mashed potato over the mince. 9 sprinkle with a little cheese, maybe some breadcrumbs, bit of chilli, few sliced tomatoes, some chopped nuts - top it as you like! 10 Bake in the oven for around 30 mins until the top is starting to brown. ps a note on servings. this would feed 2 - 3 people, depending on appetite and if you serve it with peas, green beans and other veg etc. 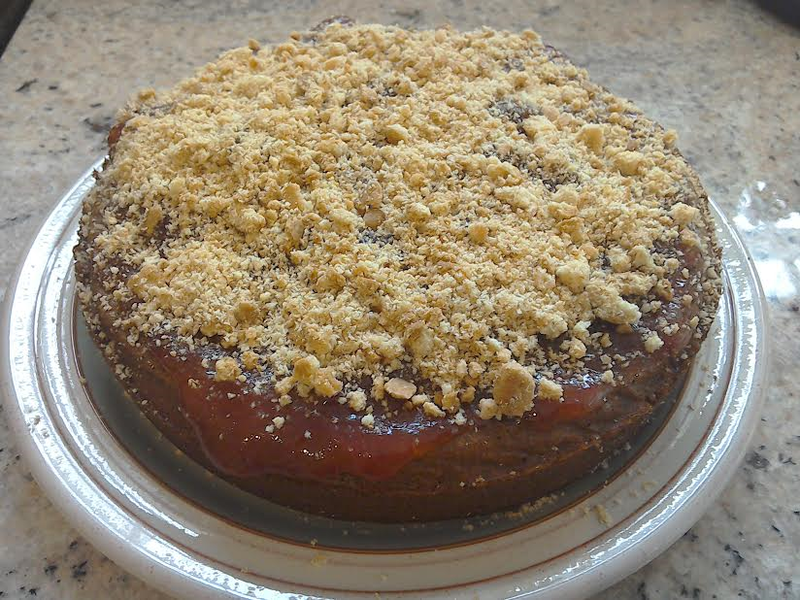 Actually obsessed with soup, so had to include a recipe in this October post, but I'm going to start off with a recipe for Plum Crumble cake. At the fete they have a huge cake competition and one of the categories was an apple crumble cake, This coupled with the fact that my friend Shara has a plum tree and makes jars & jars of sugar free plum jam every year, gave me the idea for today's cake recipe which is where I'm going to start. I used homemade biscuits for the topping - you can use any biscuits, or granola or crushed nuts if you want to keep it sugar free. preheat the oven to 180c or 150 fan oven. 50g gluten free biscuits crushed. 1 mix the cake ingredients together in a blender until you have a nice smooth batter. 2 pour into a prepared cake tin 20 cm in diameter. 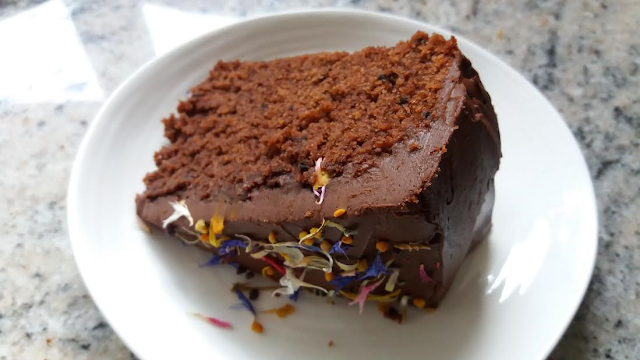 I use a loose bottom cake tin, and line the base with some baking paper and grease the sides with a little coconut oil to make it super easy to get out of the tin. 4 when cooked, remove from the tin and leave to cool. 5 When cool, spread with the topping jam and then crumble the biscuits/ granola/ nuts over the top. 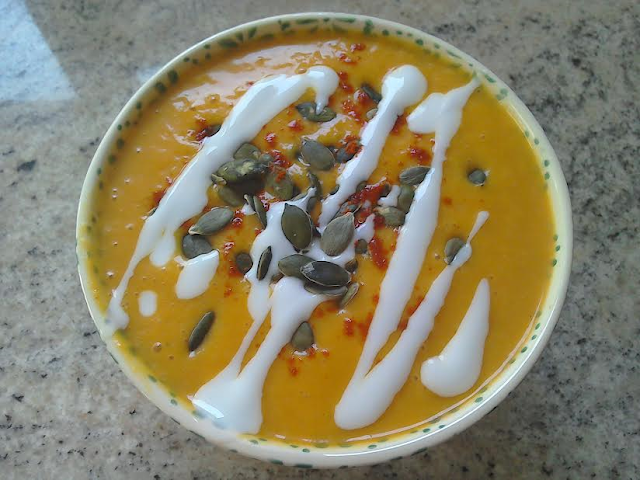 Love soup, and Pumpkin is probably my favourite, so here's a simple recipe if you've been carving pumpkins and want something to make with all the flesh! 2 put the oil into a bowl and add the curry powder. mix well. 3 Mix the pumpkin flesh into the curried oil , so that it's all evenly covered. 5 put the pumpkin, the stock, the coconut milk into a blender and blitz. 6 I purposely made this a thick soup, because you know how thin you want your soup & its easy to add more stock or more coconut milk until you get the right consistency. 7 add salt, pepper and a little chilli powder to taste. 8. warm in a saucepan and serve (You can also decorate with coconut cream and pumpkin seeds as shown above). That's all for today, thanks for dropping by, see you in November! 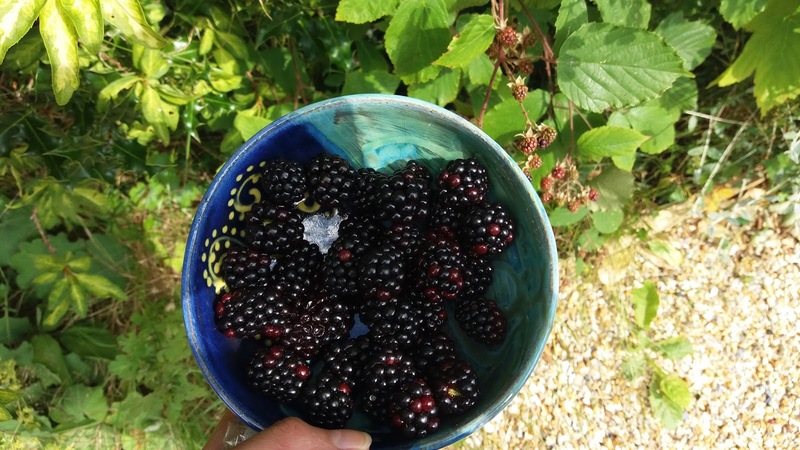 So, for this month's recipe I'm lucky enough to have 2 apple trees and a blackberry bush at my new house so.........here's what I did with them! Serves 2- double or triple to serve 4 or 6. 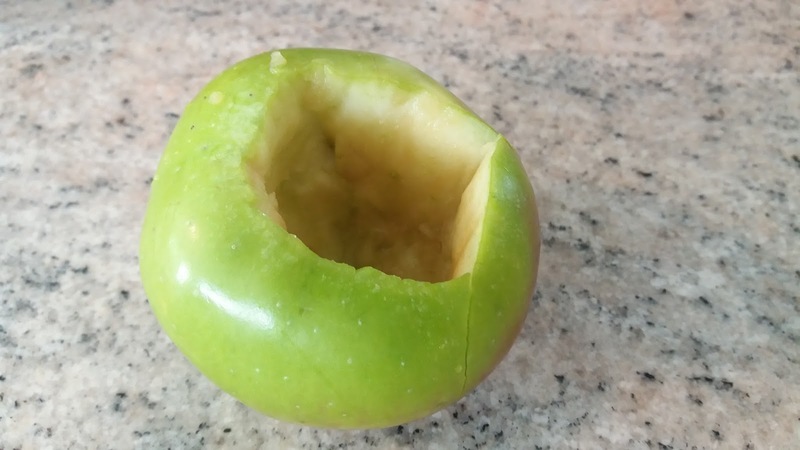 NB Make sure you don't go through the bottom of the apple - you're basically making a container for the filling. 2 chop the pecans up. Mix with the rest of the filling ingredients. 150g coconut yogurt- I used CoYo. (you can use plain Greek yogurt if you prefer). 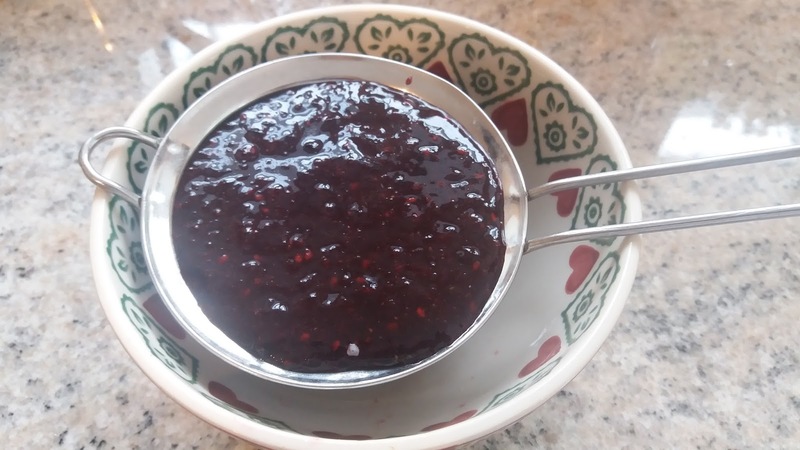 Blitz the blackberries with a stick blender. Push through a small to get the pips out. Put the sieved Berries into a saucepan with 2 tablespoons maple syrup. Bring to the boil and then reduce the heat a little so its still bubbling but not going crazy (don't worry you don't need to be too exact!) Keep stirring with a wooden spoon so it doesn't stick to bottom the of the pan. You want it bubbling away for 5 mins, then remove from heat - put the mixture into a bowl and leave to cool. Once cool mix in the coconut yogurt. 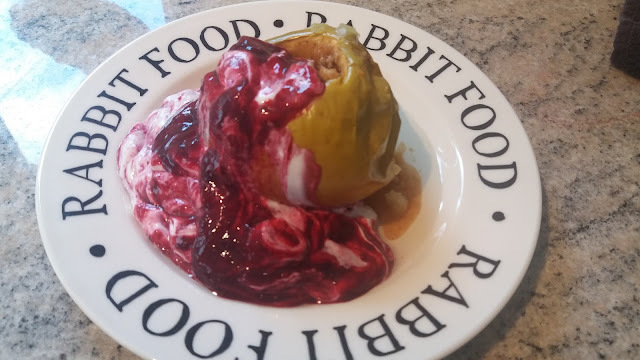 When the apples are done remove from the oven and serve with the berry cream.